To celebrate the 30th anniversary this week of the release of Tom Holland’s horror-comedy classic, FRIGHT NIGHT, Daily Grindhouse had the pleasure of talking with David Chackler, the executive producer and music supervisor for the soundtrack to the 1985 film. David Chackler spent his youth in Philadelphia listening to the soulful sounds of Motown Records. Chackler began his career in the music industry at Mercury Records, moved into radio promotion and eventually made his way over to Chicago’s Chess Records. During his prolific career, David has worn many hats and has encountered some of the biggest names in the music business: He helped break Queen to the mainstream, he had a hand in bringing Stevie Nicks and Lindsey Buckingham into Fleetwood Mac, and even worked with Luther Campbell of 2 Live Crew, helping to start the rap label Luke Skyywalker. Chackler has provided music supervision on several cult-classics that Daily Grindhouse readers may find surprising: He put the Red Hot Chili Peppers on the THRASHIN’ soundtrack, brought Dokken to NIGHTMARE ON ELM STREET 3: DREAM WARRIORS. and had a hand in the under-appreciated New Line drama/comedy, HANGIN’ WITH THE HOMEBOYS. In 2009, Chackler and Holland started the production company Dead Rabbit Films. Mike Vanderbilt of Daily Grindhouse had the opportunity to go through each track on the FRIGHT NIGHT soundtrack and offer insight into how and why these particular songs became the soundtrack to Tom Holland’s cult fright fest. Daily Grindhouse: How did you meet Tom Holland? David Chackler: I met Tom through Gary LeMel, who was the VP of music at Columbia Pictures at the time. He was an old friend of mine who called me because I had a label at Epic called Private Eye. We knew soundtracks were huge at the time and Gary wanted to put some pop soundtracks together with some of his movies and the first thing we’ve got on the slate that I want to work on is FRIGHT NIGHT. So he brought me over and I met with him and I met with Tom and that was the beginning of a relationship, a friendship that’s still going on now, thirty years later. Daily Grindhouse: Did you ever work on any of Tom Holland’s other soundtracks? David Chackler: Oh sure. I did CHILD’S PLAY. Joe Renzetti was the composer of that film. It was just the underscore, nobody put out the source cues but they put out Joe’s score, which was brilliant. Joe had won an Academy Award winner, we had done THE BUDDY HOLLY STORY years prior. I ran into a problem. The original composer we hired backed out three weeks before we filmed. Michael Compretino was the original composer and I grabbed Joe and in three weeks he came up with an incredible score for CHILD’S PLAY. I pretty much did everything with Tom from that point. We’re partners now. 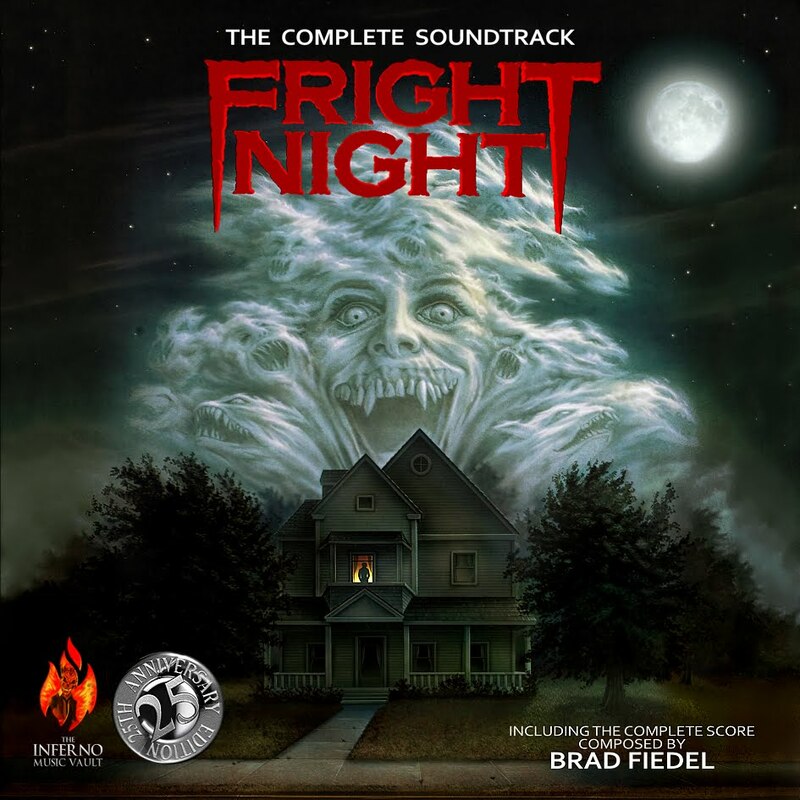 Daily Grindhouse: How much input did you have on Brad Fiedel’s score for FRIGHT NIGHT? David Chackler: I used one piece of Brad’s score on the soundtrack. Brad and I met four or five times and we talked about the concept of the electronic score. He knocked it out himself; all I did was spot cues with him. The guy’s just a genius, he really is. Daily Grindhouse: For the uninitiated, what was your role as the executive producer of the FRIGHT NIGHT soundtrack album and as music supervisor? David Chackler: I was brought in to design the musical landscape of the film. There was an effort to create a pop soundtrack that would be appealing to radio and as well as to a younger audience. That’s really what they brought me in to do. Tom wanted an electronic score and I put that together with Brad. Then I worked with Tom on the script, went cue by cue and decided what kind of music he wanted for each cue and for this soundtrack, we pretty much had them all written for the soundtrack. Daily Grindhouse: You keep mentioning “pop.” Horror and heavy metal have always been tied together. 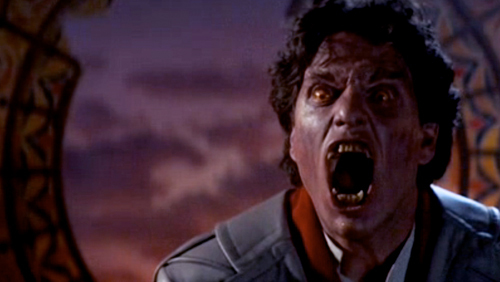 Was there a conscious effort to make the FRIGHT NIGHT soundtrack more of a pop-rock offering? David Chackler: I did a couple of the NIGHTMARE ON ELM STREET soundtracks, also and I brought in Dokken to do NIGHTMARE ON ELM STREET 3: DREAM WARRIORS. Metal was always the preferred genre of horror films. It was definitely aimed at the pop audience. Gary Goetzman and I discussed the concept of putting together a soundtrack that we wanted to reach as broad an audience as we could and we wanted to make radio friendly music to get on Top 40 radio. Daily Grindhouse: Was it your idea to include all original tunes for the movie? Was there a reason for that? Most soundtracks now are nostalgia grabs. David Chackler: Soundtracks now are based more in licensing. It’s a lot more work to have original songs in your movie. You need a couple of demos for the director to listen to see if it fits, to interpret his vision of the scene. Tom, Gary, and I had a vision for this to make a radio-friendly record. I came from the music business. I came from radio. I worked with radio and I knew what radio liked and that’s where we wanted to go because it would give us the biggest audience. Tom and I went through the script page by page and then we picked out which cues he wanted music to appear in and from where. A lot of the source cues came from background sources: radios, tape players, wherever he wanted it to come from. Tom had it in his mind. Tom is a very musical guy. Daily Grindhouse:What do you say we go through the FRIGHT NIGHT soundtrack, song by song, starting with Side 1, Track 1..? David Chackler: We wanted something really pop and fun to get people dancing and jumping and smiling. J. Geils Band was just that kind of a band; they had just come off “Centerfold.” We cut it up at their studio up in Maine. I was there for the recording and we spent a lot of time on the coast eating lobster. We had a staff writer by the name of Joe Lamont, who was an Australian — great writer. He wrote that track. That single got a lot of airplay, that single charted. The movie got hot and I think radio picked up on that and they loved the single. It’s a great song. David Chackler: A guy named Mitch Lee who was an intern of mine at the time brought autograph to us; he’s now the head of music at Disney. He had played me the song and I played it for Tom. Tom loved it and we slotted it right into the cue. They were signed at the time to RCA. Evelyn King came from RCA as well. David Chackler: When Queen did their first tour in America, they opened for Mott The Hoople. I knew they guys and wanted something that sounded like Mott The Hoople, so I said let’s just grab Ian and do it. They loved it because they were not that hot at the moment. They loved the script. I went through the script with every one of the guys who worked on this thing because I wanted to keep the tone consistent. I didn’t want it to be all over the place, except for the seduction scene where we had specific use for more of an R&B thing. I wanted it to be a soundtrack that was cohesive and became part of the emotional fabric of the film. It was a fun movie; Tom may be the best writer in Hollywood. You can’t duplicate the way he writes. Everything has some humor in it. All of his movies became iconic because they were fun. CHILD’S PLAY really was fun and FRIGHT NIGHT was a fun movie. I just loved Ian’s stuff. I think Mick Ronson is a genius too. David Chackler: They were a Canadian group. That was the only song I believe that was not original. Rock Myself To Sleep was a licensed track. It was in the coffee shop scene. It had not been released at the time and as far as people were concerned it was new; the April Wine record had not been released yet. A friend of mine, they were on a label up in Canada and they just sent me the song for something else and I said, “That just fits perfect in that scene.” It was just one of those magical things. The record company was pretty popular at the time we had a lot of hits. People were always bringing us product and somebody brought me this band from Canada that they wanted us to release in America. I said, I love this track and that’s how we got this track. They later became Katrina And The Waves, who performed the song on Break Of Hearts. David Chackler: They’re very hip. Two guys named Gary Goetzman and Guy Piccirillo, they had a production deal with us and Gary was best friends with David Byrne. David was in the office talking about the script. I met David through Gary. We were at the office one day, and David Byrne said this would be great for Devo; this is a great script and Devo should be in this. David loved the idea and he loved Roddy McDowall. Gary really put that together. Devo demoed a couple of songs that we went through, mostly guitars and vocals really so we got the idea. I just loved it and I loved Devo. David Chackler: Oh, Sparks. They were kind of off center; that’s great. It was fine. To me it was all about the music, it was all about the songs. I was always a song guy and I loved their music. I leaned a lot on Gary and Mike because they were great for this. We were looking for something for that scene around the nightclub, there’s like a four or five song sweep that we did there. To me nothing fit in better than that title. They came up with the title based off of the script. Absolutely perfect, we were leaning right into the disco and it just laid in perfect. David Chackler: That was just a great song, an incredible song. I just talked to her husband Freddy Fox, another artist of mine and a great guitar player. It was one of our guys brought the song. To me it was a little bit of a seduction scene and I wanted something real R&B going back to my own roots. I think this may be my favorite song on the soundtrack. Unfortunately, she was at the time signed to RCA, so I had to get a deal with RCA to let her perform on this soundtrack. The deal was that I could not put a single out. She recorded the song for FRIGHT NIGHT and as far as I know it’s never been on an Evelyn King record. She loved the script. It’s part of that four-song sweep in the nightclub, which is a great sequence with our Chris Sarandon, our GQ vampire. I just saw Chris in New York while we were doing interviews for the documentary. We still talk and e-mail a bit. DC: They also appeared on the THRASHIN’ soundtrack, and if you look at THRASHIN’, you’ll see the music supervisor was me. They were managed by a friend of mine and I used them whenever I could because I loved them. The manager liked the script and had them record it for the movie. David Chackler: I just reminded Tom who they were yesterday; he didn’t even remember. He didn’t remember. The Fabulous Fontaines were Mike Piccirillo and Gary Goetzman. They happened because we had one more music cue and no more money. They were a staff producing team of mine and great writers. Mike probably played guitar and Gary was probably on synth. Mike became a tremendously successful writer of cartoons; he wrote for DIC, he wrote for Saban, all those Saturday morning cartoons. He was huge, a very commercial writer and a very pop guy. Gary went on to become Tom Hanks’ partner. He’s now one of the great producers of Hollywood. He has an Academy Award, he did Band Of Brothers, he is Playtone. They were definitely involved in everything on this movie along with Mitchel Leib. We talked about it to get a feel for the cue; it was a source cue out of Charlie’s radio. We thought, “What would he be listening to?” and we decided this would be it. We played the demo for Tom and then we cut it, never to be heard from again. I get asked every interview; everyone wants to know who the Fabulous Fontaines are. We were sitting around drunk probably, somebody said something about Frankie Fontaine and we said, “That’s a great name for the group.” It’s an interesting piece of trivia. David Chackler: The only piece of the score on the album; we felt that was the most commercial excerpt from the score. It would fit closer than anything and I made a promise to Brad that he would be on the soundtrack. We thought it was a great way to end the album. Scores weren’t really big in the ’80s. You had a few labels but it was more like classical music. You had certain fans but it really wasn’t a big thing. It was still a time when most people wanted orchestral scores. The electronic score for FRIGHT NIGHT was a two-part decision; one part of course was that Tom wanted an electronic score because he fell in love with Tangerine Dream, the other part was budget. We didn’t have the budget for an orchestra. Daily Grindhouse: What did Columbia think of this pop soundtrack? David Chackler: Columbia could have cared less about that movie. Gary knew the soundtrack was going to be part of marketing the movie. I have to be honest; Gary LeMel and I both felt that it was going to be bigger than the studio did. The film was so perfectly cast and written. I came out of the music business, I had a lot of friends, I called in some favors and got some things cheaper than others would. It helped us with getting things done for much less than a normal budget. I never hired somebody because of the budget, I would just decide what I wanted and then go beat them up. I was not going to be constricted by budget. Daily Grindhouse: Do you remember the soundtrack doing well? David Chackler: The soundtrack did great. Everybody loved the music and radio reacted well. We released “Fright Night” as a single. Daily Grindhouse: Did you think you’d still be talking about the FRIGHT NIGHT soundtrack thirty years later? David Chackler: No, Tom and I were laughing about that yesterday. If we would have known what this movie was going to become while we were doing it, we would have done things differently, but then it wouldn’t have been that great, maybe. Tom and I are both amazed at the longevity of the movie and the soundtrack. It’s kind of become immortal, like a vampire. Prev THE NEW RELEASE WALL FOR AUGUST 4TH, 2015! HOT FIRE!